The Falcons' Aiden Maloney seals win with late pick, sends team to state quarterfinals. Sunset quarterback Callum Craig and the Apollos valiantly drove the ball down to Falcon 28-yard line with a minute to go. Needing a touchdown to send the game to overtime, Craig tried to go to the end zone with a deep pass but Maloney ranged over from the middle of the field, plucked the interception and took a knee in the paint for the game-sealing pick. 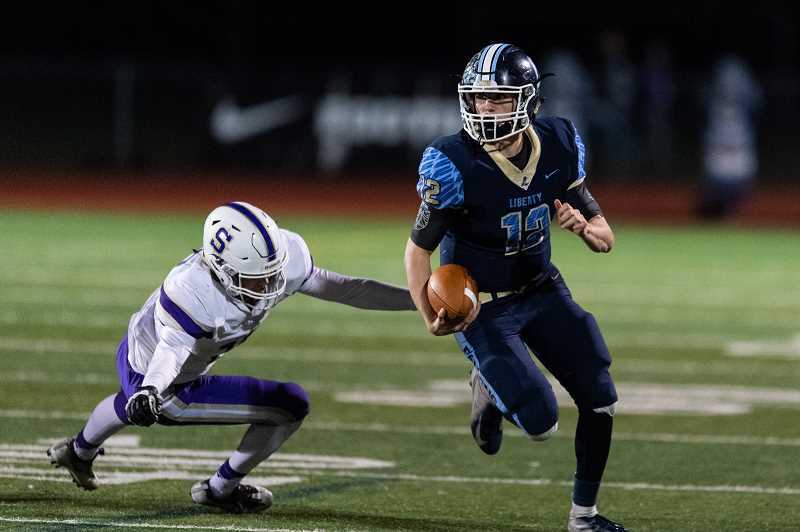 Liberty, who just moved up to the 6A classification three years ago, is going to the 6A quarterfinals where it will play defending state champ Clackamas at Clackamas High next Friday. "It shows a lot about the character of this team, never getting down, never thinking we were going to lose," Maloney said. "It was a great team win from that aspect." "We just did what we practiced all week and were playing for each other," Craig said. "The great thing about football is you don't know what is going to happen. You just have a job to do and you're doing it for the boys out there." Momentum, such an intangible notion, was authentic for both sides. Trailing 8-0 in the first quarter, Sunset reeled off 28 straight points to go up 28-8. 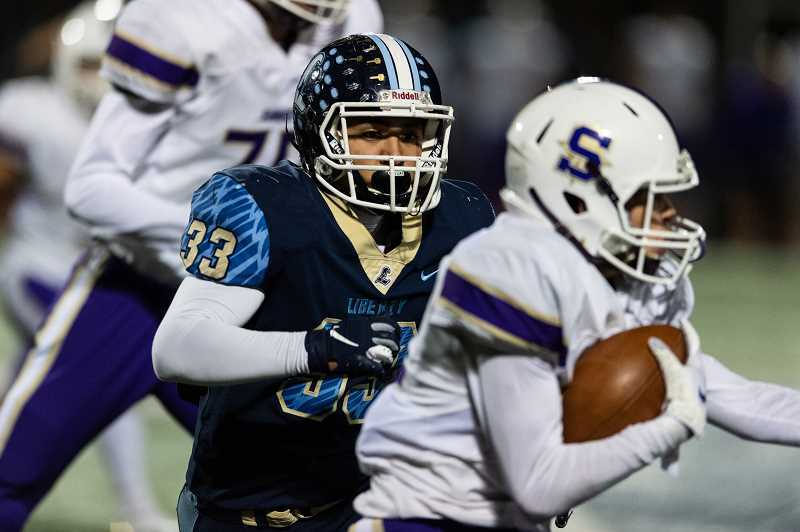 And down 28-8, Liberty returned the favor with 21 points from the 6:47 mark in the second quarter through its first drive of the third when Norman scampered to the house for a 16-yard score that reclaimed a 29-28 Falcon lead. After Neyembo's pick-six, the Falcons answered with a Maloney 42-touchdown run, a fourth down stop on defense, and a 21-yard touchdown pass from Norman to Brown to pull within a score at the break. With Liberty's offense, the Falcons are never out of any game. Brown, Maloney, Bafaro, Norman are all game-changing talents who can turn a contest on a single play. "It's hard to cover six fast guys that love to run with five huge guys up front that love to block," Maloney said. "Those summer workouts, conditioning all of the time, really paid off." Sunset reclaimed a 31-29 lead in the third off a Hayden Skiba field goal. But on Liberty's next drive, Bafaro took an option pitch from Norman, broke two tackles, busted out to the perimeter and raced down the sideline for the 41-yard score. The burly senior back added the two-point try to reclaim a 37-31 lead for Liberty with 3:16 left. And after a Falcon stop, Norman took a quarterback read option behind left tackle Diego Rodriguez and a pulling center Jarret Boyce into the end zone for a 10-yard score that extended Liberty's lead to 44-31 with 11:28 to go in the fourth quarter. Bafaro ran like a monster in the second half, Brown was the highlight reel pass catcher who also snatched a pick and Maloney simply made big plays everywhere: catching the ball, toting the rock or in the kicking game. But Norman might have been the biggest nuisance of all. 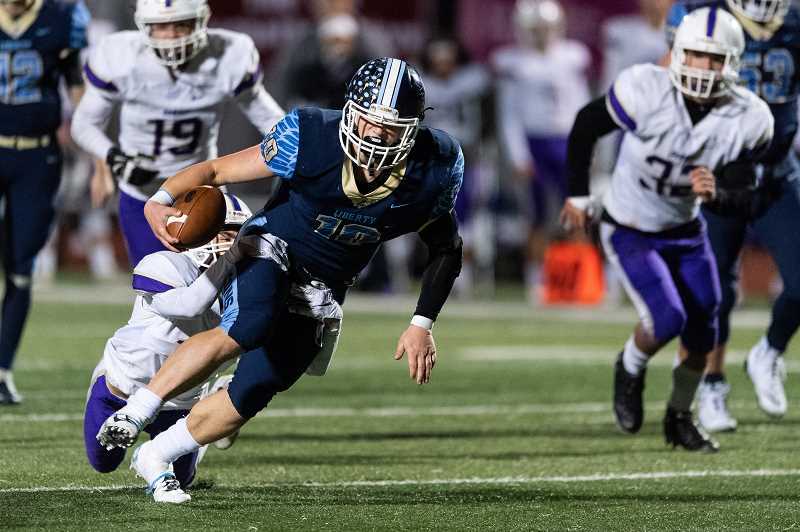 The slithery signal caller ran Liberty's super-charged, shotgun Veer formation to a tee, cutting through holes, extending plays with his long legs and firing off ropes to areas where only his Falcon receivers could catch the ball. His style was pure sandlot, which makes sense considering the senior used to play football out on the street with his brothers and their friends who were three or four years older than him growing up. "I learned the best way to not get hurt is to not get tackled," Norman said with a smile. "That's what I try to do out here." The Falcons however, didn't blink. Rather, they handed the ball to Bafaro, who ripped off runs of 29, 1, and 34 yards on the game-winning drive, sprinkled in with chunk gains from Maloney and Norman to move the ball into the red zone. Smith scored his three-yard touchdown run off the option give from Norman. And on the two-point try, Norman rolled right, couldn't find anyone open, reversed course to his left to buy time, found a still moving Brown and hit him in the back of the end zone for the toe-tapping two-point try to make a one score game, 51-44. Brown, a tall, sinewy pass catcher with a huge catch radius and big-time athleticism was Norman's go-to in the passing game. Liberty is next scheduled to play at No. 2-ranked Clackamas, Nov. 16, with the time yet to be determined.